I first became an Independent Beachbody Coach about a 8 month ago. After almost completing my first round of P90X my coach, Josh, approached me about the opportunity to become a coach. I had gotten great results from P90X and already turned friends and family onto the program. I was already interested in helping others with their health a fitness so I researched it. I was skeptical but after doing my research I quickly realized that this could be a great opportunity to make a difference while getting paid to do it. Low start up fees, and about the same amount a month that one would pay for a magezine subscription. I figured I couldn’t go wrong, and I didn’t. My goal was to make enough to cover my supplement costs. And at first that is exactly what I did. I was helping others, sharing tips and nutrition advice on the P90X message boards. It was actually very fulfilling to hear that I was helping people reach their health/fitness goals. I would have even done it for free. But people started adding me as their coach and I began to get more people signing up for my team. As time went on I started to get checks every week from Beachbody. As my customers grew so did the checks. Fast forward to now and I am now getting a significant amount of money per month. Enough to cover some of my major bills. This is something that I currently do part-time! I couldn’t ask for a better, more fulfilling way to supplement my income, especially during this current recession. 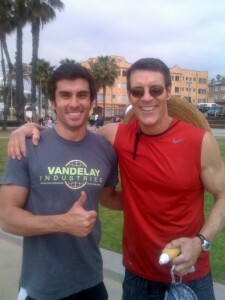 I have been able to meet my fitness mentors (Tony Horton, see photo) and other like-minded people through the Beachbody community. If you are looking for a chance to make some money and get into the best shape of your life, Beachbody Coaching is an excellent opportunity! Look what is it accomplishing for me!